Shawnee State’s Shania Massie earned Mid-South player of the week honors for the first time in her career on Monday. Portsmouth, Ohio – Shania Massie was named Mid-South Conference Women’s Basketball Player of the Week on Monday afternoon. Massie played twice over the weekend at the Zweifel-Pritchett Classic in Wilmore, Kentucky, notching two double doubles. Her first came against Asbury (Ky.) on Friday, when she scored 18 points and grabbed 11 rebounds, while adding five assists, three steals and a block in Shawnee State’s 97-66 win over the Eagles. Massie then had 28 points and grabbed 13 rebounds while also getting two assists and two steals in SSU’s 111-74 win over Oakland City (Ind.). The award is Massie’s first Player of the Week award in her career. Shawnee State now have two Player of the Week awards in 2018, with Ashton Lovely having won the award on October 29. Shawnee State women’s basketball return to action on Friday, November 23 for day one of the NAIA Invitational Classic in Jackson, Tennessee. The Bears take on No. 12 MidAmerica Nazarene (Kan.) at 2:00pm. 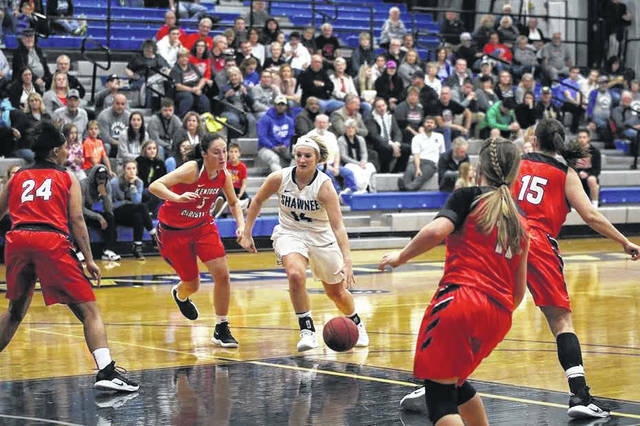 https://www.portsmouth-dailytimes.com/wp-content/uploads/sites/28/2018/11/web1_massie_msc.jpgShawnee State’s Shania Massie earned Mid-South player of the week honors for the first time in her career on Monday.